SIMON Stretton knows plenty of people hate dingoes. He understands people are raised to see them as dangerous and vicious; a danger to children and stock. But to him, that could not be further from the truth. "There's this mystery with these wild animals, and I've found myself living with them," Mr Stretton said. "There is superior intelligence with them. I'd love to be able to tap into their head." Mr Stretton owns and operates Durong Dingo Sanctuary. He has owned the property since 1984 and now shares it with 17 Fraser Island dingoes. The way he talks about the animals, it is clear they are more than just wild animals in his care; more than pets. Now, Mr Stretton is in a situation he never planned for, and the lives of his dingoes are at risk. He says if he is not able to come up with bank repayments by October 1, he will lose his property and be forced to put his dingoes down. "People say the dingoes can be re-homed, but they can't, which means they're all going to be put down," he said. "I'd have to shoot them and I want to avoid that at all costs." Hanging out with the dingos: Students have been working with the Durong Dingo Sanctuary. With only a few weeks left, Mr Stretton has renewed his appeal for assistance from the public. A proud, hard-working man, he said he was not the type to ask for help. "I feel embarrassed asking for help, but it's not for me, it's for the animals," he said. "It's not my fault I'm where I'm at, but I can't afford to be homeless. It's embarrassing. A man of my age, I've worked all my life because I liked what I was doing." Durong Dingo Sanctuary : Simon Stretton from the Durong Dingo Sanctuary talks about why he finds dingoes so important. Mr Stretton does not just want to see the sanctuary saved - he wants to see it thrive. He recently received funding for and started building a public toilet on his property. He has visions of turning it into a tourist attraction that will help put Durong on the map, like the Irwin family did with Australia Zoo. "I look at Bob Irwin. He started off with two acres, then Steve started doing his exhibitions. Now they've got 75 acres," Mr Stretton said. 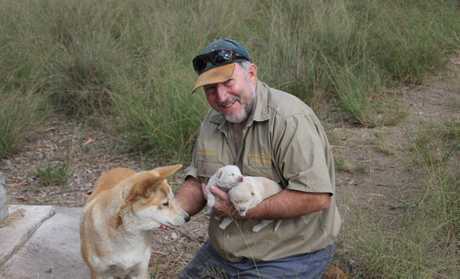 Durong dingo sanctuary operator Simon Stretton with puppies born in 2014. "I'm not a Steve Irwin, I'm not famous, but I think I'm doing something good and I think the sanctuary could become bigger and better." At the end of the day though, he said, he relies on donations to cover expenses and his income is not keeping up with costs. "I've been in business long enough, and if you get into debt, you've got to bring in income to service the debt," he said. On a disability pension because of ongoing health problems, Mr Stretton is unable to work to cover the sanctuary expenses. 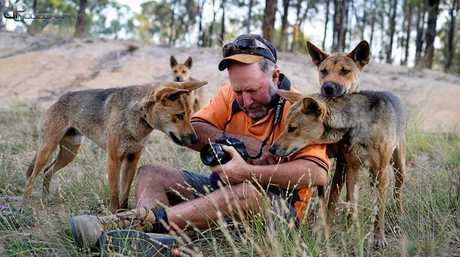 All his energy goes into caring for the dingoes and doing what he can to preserve the species. "I like to do good and I like to help people. 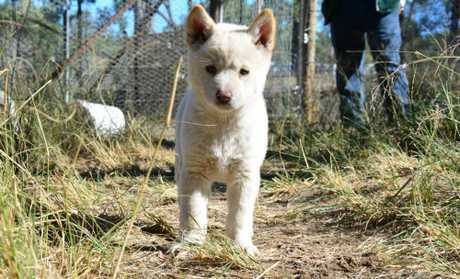 I thought with the dingoes, trying to save them and do some good, I'd get 100 acres and put them there," he said. He is still in the process of exploring grant options through his registered charity, but in the meantime, he needs support to get through this rough patch. "It would be a massive waste for all that to be gone," he said. "It's just so wrong for them to have to die." To support Mr Stretton and his dingoes, visit www.durongdingosanctuaryqld.com.au.